Having a hard time deciding on the perfect gift for dad? SURROUNDINGS FLORAL STUDIO can help! Send dad a artistically crafted floral tribute to show him how much you care. Perhaps your dad is the type that would prefer a gift basket filled with his favorite snacks! Whether your dad lives in Schenectady, or clear across the country, we've got you covered! Fall is a favorite time for flowers. The colors of autumn abound during this beautiful season of Thanksgiving. Let SURROUNDINGS FLORAL STUDIO help you bring this color into your home with the help of autumn flowers. With the simple addition of flowers on your Thanksgiving table, your family dinner will transform into a glorious Thanksgiving feast! SURROUNDINGS FLORAL STUDIO in Schenectady can help you say "I am thankful for you," to any friends and family who are unable to make it to your house for the holiday. Just give us a call, we are thankful for you. Flowers never fail to bring a smile to someone's face. Who could use a smile more than your boss? SURROUNDINGS FLORAL STUDIO can help you choose a fantastic floral arrangement that's sure to make your boss turn that frown upside down. Who knows, maybe you'll get out of work a few minutes early? We all know people who go out of their way to do wonderful things for others and never expect anything in return. Sweetest Day is THE DAY to show them how much you appreciate them. Nothing satisfies a sweet tooth like a gift basket full of yummy snacks. SURROUNDINGS FLORAL STUDIO in Schenectady can help you select the right sweets for your sweetie this Sweetest Day! Christmas flowers from SURROUNDINGS FLORAL STUDIO in Schenectady, NY are the best way to send Christmas cheer! Flowers and poinsettia plants are a great way to spread joy throughout the season, but also make quick and easy party decor. 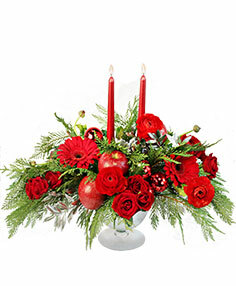 SURROUNDINGS FLORAL STUDIO can help you with any Christmas styles or colors with our Christmas decor accessories. Need a centerpiece or a Christmas wreath for your party? SURROUNDINGS FLORAL STUDIO has it, and more!